Lloyds of London, a huge hit, was Ty Power's big breakout role... the one that made him a star. Henry King, the director, had to use his considerable influence to convince Darryl F. Zanuck to star Ty in Lloyds of London. Up until that point, Ty had been in only a couple small roles in 20th Century Fox films ... Girls' Dormitory and Ladies in Love . Though he'd received quite a bit of fan mail from his brief appearances in those two movies, he still hadn't "clicked" with Zanuck. Ty was struggling to break into motion pictures when, one day, he walked into Henry King's office. King was busy working on Lloyds of London when his secretary told him that "There is a young gentleman here, and he hopes you can spare him a few moments. His name is Tyrone Power, Jr." Upon hearing the name, King remembered having worked with Ty's father in the movie, Fury. He granted the request for a few moments; was very impressed with him; and decided to test him for the upcoming role of Jonathan Blake in the new picture, Lloyds of London. Don Ameche had already been penciled in for the part, but, following the screening of the two actors' tests, King convinced Zanuck to put Ty in the movie. Film editor, Barbara McLean, agreed with King that Ty was the best actor for the job, and her opinion also counted with Zanuck. The leading lady was to have been Loretta Young, who walked out on the movie when she found out that her role was being sized down in order to give Ty the big star buildup. The size of his role was increased considerably, while hers was reduced. Madeleine Carroll, considered one of the most beautiful of leading ladies of the day, was brought in to replace Loretta Young. Loretta Young, who had been billed above Ty in Ladies in Love went on be his leading lady in four other movies... and billed beneath him. Though Ty's screen time was the most of any actor in the movie, he was billed fourth. Billed first was child star Freddie Bartholomew, who appeared only as the child, Jonathan Blake, in the opening minutes of the film. 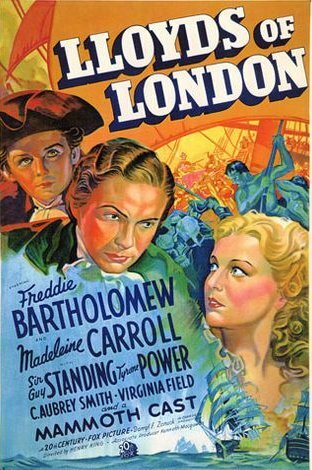 Next billed were Madeleine Carroll and Sir Guy Standing, both known actors at the time. This would be the last time that Ty would not be either top-billed, or, in a very few instances, second billed. This movie marked the beginning of a long friendship with Henry King. King went on to direct Ty in ten more movies. This was a very big movie, not only for Ty but for co-star, George Sanders. Sanders' first big Hollywood role was as Ty's antagonist in Lloyds of London. The two of them became life-long friends, and, by a twist of fate, Sanders also appeared in Ty's last film, Solomon and Sheba. It was George in the dueling scene with Ty when he suffered his fatal heart attack in 1958 while filming that movie. The two of them appeared in five movies together: Lloyd's of London (1936), Love Is News (1937), The Black Swan (1942), Son of Fury (1942), and Solomon and Sheba (made in 1958; released in 1959). Variety: "Tyrone Power, Jr. is cast as Blake after Freddie Bartholomew has grown up. He's a new hand in films, having played only a couple of bits previously. He's okay. He's going places. He has looks and he has acting ability. The women ought to go for him in a big way." Los Angeles Examiner: "Not in a long time has there been a player so dynamic and promising as Tyrone Power." New York Herald Tibune: "The chief acing in the piece is done by Tyrone Power, who gives a remarkably assured performance in both the romantic and trading sequences, accenting the show with a definitely heroic quality." Time: "Rich in the atmospheric detail of all good period pieces, warm with the honest adulation which English heroes alone seem capable of inspiring in Hollywood producers, it is an insurance drummer's dream. It makes the business as exciting as a bugle call, magnificently somber as the roll of muffled drums." The Literary Digest: A stunning motion picture, worked out in elaborate detail. It takes its place with Mutiny on the Bounty as one of the finest pictures to come from Hollywood." Belafonte, Dennis. 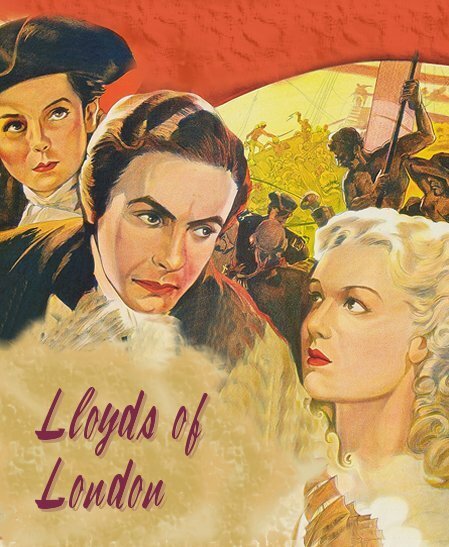 Films of Tyrone Power. Secaucus, N.J.: Citadel Press, 1979.